Hunt For Wolverine: Claws of a Killer #4 Review – AiPT! The hunt for Wolverine continues. At this point, it’s safe to say I’ve suffered through most of the “Hunt for Wolverine” comics up to this point. They all haven’t been bad, but their premise of hunting Logan has been basically a lie up until this point. 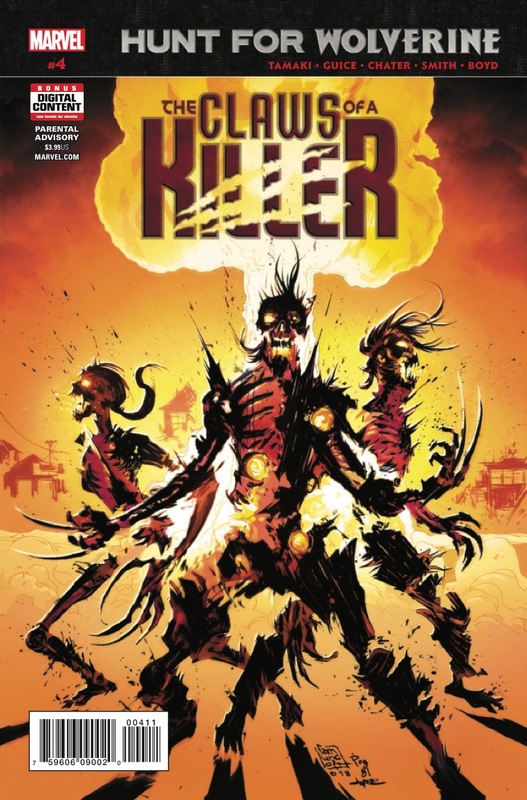 Claws of a Killer has been possibly the worst of the bunch due to the plot consisting of setting up Daken, Sabretooth, and Lady Deathstrike and then having them slowly fight zombies for three issues. Presumably, this will lead into Hunt for Wolverine: Dead Ends which may (or probably not) actually result in the characters finding Wolverine. If you want to fully understand that miniseries you’ll probably need to know how this miniseries ends. Check out how the layout is tilted. Cool! Credit: Marvel Comics. Props to Butch Guice and Mack Chater who have done a phenomenal job making this book look gritty as hell. We’ve got three killers ripping through zombies and taking real damage and you feel every panel of it. If you like violence in your comics this is for you. If you were holding out hope for any of this miniseries to build towards something you are going to be sorely disappointed. There’s certainly some kind of ending here, but it’s a total fake out and really insulting to the reader. I can sort of see what the point of it all is–essentially, Marvel is showing every Logan-related character and how they fit into his return–but this miniseries out of all of them really didn’t need to be made. To make matters worse it’s hard to care about the characters at all. They’re all deplorable and violent killers who don’t deserve a happy ending or a way out. Add to this the series is basically one long sequence of them fighting zombies so as to escape with little character work going on they basically become faceless characters. So when these characters do nearly nothing by the end of the comic you will continue to feel frustration over it all. It’s also shocking how boring this is because it’s nearly all action. The layouts suggest not much was planned for even the action sequences with three to five panels used to show limping action of these villains fighting pointless zombies. For four very long issues, these characters have basically punched and clawed their way through zombies with nearly no reason given. It makes sense then that two of them just assume the third is dead and drive off. This has to be one of the most pointless mini-series I’ve ever read. The book has looked nice, but there has been little to no work done on the characters or villains to make any of it mean a thing. The fact that this ending continues to fall flat even when it promises some resolution is further evidence it never needed to be made. This series has served absolutely no purpose beyond stretching out tepid action scenes and leading the reader on.